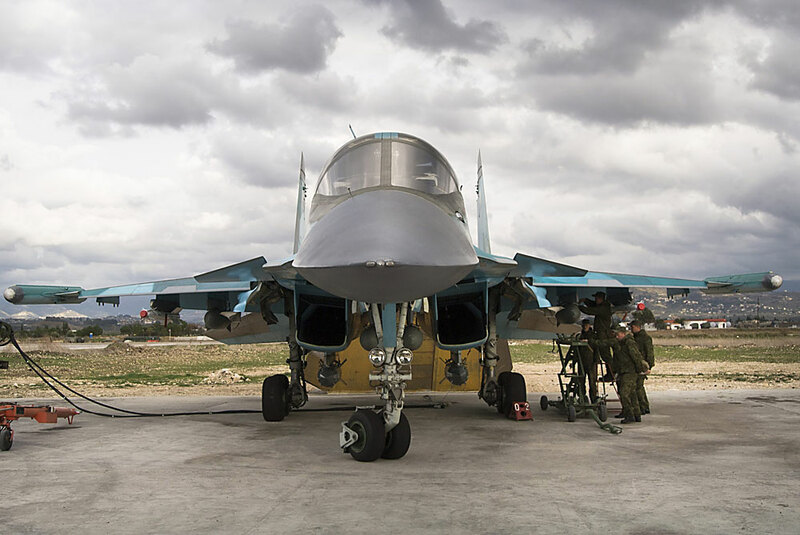 Russian air force crew prepare a Su-34 bomber for a combat mission at Hemeimeem air base in Syria. Russian President Vladimir Putin has ordered the withdrawal of the main part of the military group in Syria. According to Russian observers, the pullout will affect land and aerospace forces, while the fleet and missile defense and intelligence systems will stay in the region. Russian President Vladimir Putin has ordered Defense Minister Sergei Shoigu to begin the withdrawal of Russian forces from Syria as of March 15. "I consider the objectives that have been set for the Defense Ministry to be generally accomplished," said Putin, speaking on March 14. "That is why I order to start withdrawal of the main part of our military group from the Syrian Arab Republic, starting from tomorrow." He noted that before pulling out, the Russian armed forces should organize effective protection of the permanent Russian military bases at the port of Tartus and the Khmeimim airbase, which will continue to function as usual. "Part of our military group was in Syria traditionally for many previous years, and now will have to perform the very important function of monitoring the ceasefire and creating conditions for the peace process," Putin added. According to Fyodor Lukyanov, editor-in-chief of the Russia in Global Affairs magazine, Russia has fulfilled its main task in Syria and did not allow the country to repeat the Libyan scenario – to become a completely uncontrolled source of instability in the region. "The main objective of the Russian aerospace forces' operation was not only combating ISIS militants, but turning the tide of the civil war," Lukyanov stressed. "Due to our airstrikes, the government army was able to force part of the radical opposition and terrorists out of the largest cities in the country." However, Moscow has been accused by the West of using the campaign against ISIS as a cover-up for the strategic targeting of rebel groups opposed to Bashar al-Assad, in an attempt to bolster the Syrian leader’s position. According to Lukyanov, Russia will follow the path of the United States in Afghanistan – it will withdraw a significant part of the troops, but keep a politically relevant and efficient group in place. So, part of the Russian armed forces will be continue to be based on Syrian soil, at the port in Tartus and the Khmeimim airbase. According to Vladimir Yevseyev, head of the Eurasian Integration and SCO Development Department of the CIS Countries Institute, the withdrawal will affect only the land and aerospace forces. "The group of warships in the Mediterranean Sea will be fully preserved, as well as missile defense, electronic warfare and intelligence systems in the region," Yevseyev told RBTH. "Russia wants to initiate the peace process and, therefore, is ready to pull out the 'combat' part of its troops." According to Yevseyev, should events develop unfavorably and Turkey and Saudi Arabia take advantage of the reduction of the Russian military presence, Moscow will return its aerospace forces in full. "There is no 'victory on land' yet," he said. "Russia is trying to reverse the situation, in order to reduce the number of foreign players in the Syrian affair. To succeed at the current military pace will require at least eight months of fighting and attacks from the air, which will result in the destruction of infrastructure and the deaths of civilians. No one wants this." According to him, Russia held closed consultations with the United States and started the pullout after being promised that the Turkish involvement in Syria would be reduced. "In this case, the crisis will be solved faster. Similar obligations may also be made by our partners in Saudi Arabia," said Yevseyev. Since Feb. 27, the ceasefire proposed by Russia and the United States has been in effect in Syria. The truce does not cover militants of the terrorist organization Islamic State. The military operation of the Russian aerospace forces against militants of the terrorist group Islamic State in Syria began on Sept. 30, 2015. As Russian Defense Minister Sergei Shoigu said during a meeting with President Vladimir Putin, Russian forces liberated more than 400 settlements and flew more than 9,000 sorties, destroying more than 2,000 ISIS militants. According to Shoigu, the Russian aerospace forces also destroyed more than 200 Islamic State oil production facilities and were able to completely cut off the terrorists’ supplies.